To make sure Joe’s dining experience is memorable, Charlie and Graham season the ground chuck before grilling. I let the fellas borrow my own special blend of spices for the above-mentioned scene. 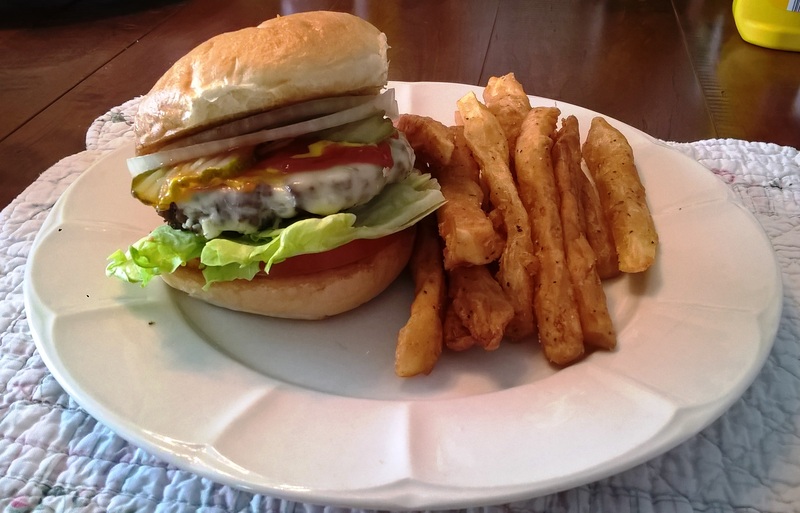 It’s what I call my ‘burger masala.’ Read here (What I Like About Being an American) to discover how the seasoning recipe came to be, and then you’ll understand why an exact recipe doesn’t exist. To feed my family and parents, I used the quantities below, but again, it’s alterable based on how many you need to serve. The variety of cheese and whether or not you use seeded buns is also up to you. I started with two one-pound portions of ground chuck. I like the 80/20 blend that gives flavor and juiciness. I find that ground chuck has a ‘grain pattern’ to it much like a whole steak. Cutting across this pattern ensures that the ground chuck stays together when pattying. Cut the 2 lbs. ground chuck across the ‘grain pattern’ into six equal portions. Place the cut side down on a cutting board and gently press down from the center with the flat of your hand. While pressing the ground chuck into a thinner dimension, shape it into a round patty with the fingers of your other hand. I prefer 4 ½ inch hamburger patties. Remember, starting with a patty larger than your bun will guarantee you end up with a hamburger that covers the bun after cooking. Place the hamburger patties on a platter and liberally douse with Worcestershire sauce. Sprinkle them with a hearty pinch of raw sugar. Season the hamburgers to your taste preference with the garlic powder, salt, pepper, and paprika. Cover and place in the refrigerator for at least an hour. Give the hamburgers enough time to reach room temperature before grilling. Heat a grill to high heat and cook the hamburgers to preferred doneness, flipping once to keep them from burning. Don’t press the hamburgers with a spatula while cooking. You want the juices to stay in your meat. Add slices of cheese to the hamburgers and allow it to melt. Remove the hamburgers to a platter, place them in an oven on warm, and allow them to rest. Slice your hamburger buns if necessary. Spread each side with butter and toast them in a skillet or on a griddle until golden brown. Place the cheesy hamburgers on the toasted buns, add your favorite toppings, and enjoy! Shabbat Shalom to all my friends. May your weekend be peaceful and productive. Ava Maria Tedesco is a tender-hearted girl of thirteen. While she knows that stuffed animals aren’t real, she can’t quite help but extend to them the same compassion she showers on animals, people in need of prayer, sometimes her siblings, and always her parents, Grandma Josephine, and Sister Mary Agnes. One of Ava’s favorite stuffed animals is Mr. Monkey. 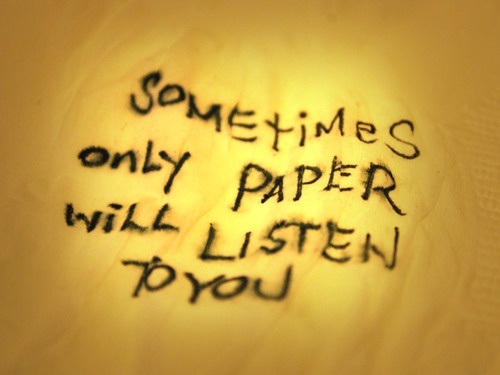 Unfortunately for Ava, her older sister, Katherine, knows this. Katherine only meant to kidnap Mr. Monkey for a short time to torment her younger sister, but when she hides the rubber-face stuffed toy in their mother’s dryer, all does not end well. I based Ava Maria’s favorite stuffed toy on one I had as a child. In fact, Freddie is still packed away in my basement with all my other childhood stuffed toys even as I type. I don’t know where I obtained Freddie or how that came to be his name. 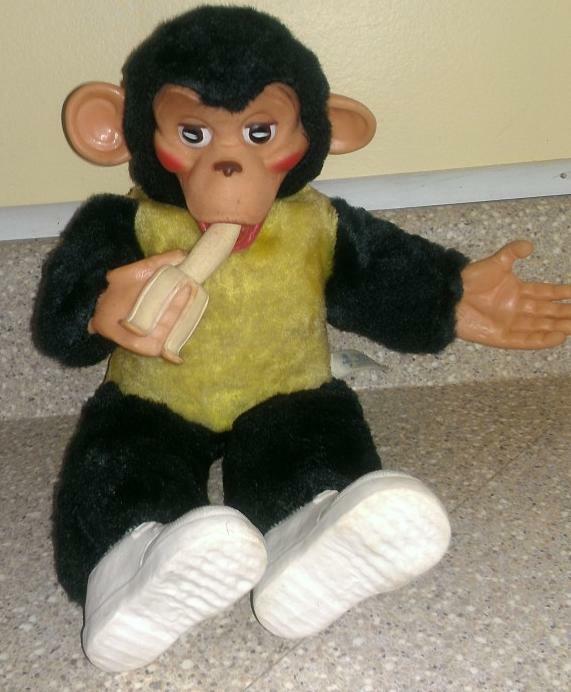 I just remember being fascinated by his rubbery face, hands (one of which holds a banana), and little white shoes. Even before I can remember, one of Freddie’s shoes somehow became slightly detached from his hairy legs and had to be safety pinned in place. When I researched the doll for my novel, The Tedescos, I came across pictures of the one I had as well as one with the word Zip on the front of his yellow shirt. 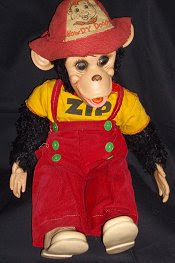 The Zip doll was the representation of the actual chimpanzee, Zippy, who was a television star in the 1950s. Zippy had been discovered by Bob “Buffalo Bob” Smith of Howdy Doody fame, and the chimp appeared on the show. Zippy also appeared on The Ed Sullivan Show, Captain Kangaroo, Gary Moore Show, and Jackie Gleason Show. The Ruston Company made the Zip stuffed doll in response to Zippy’s popularity on Howdy Doody. Howdy Doody ran from 1947 until 1960, and while I have yet to find documentation supporting this fact, either The Rushton Company continued to produce the popular stuffed doll long into the 1970s (my childhood) or children took extremely good care of their toys. Another possibility allowing the doll to make it into the 1970s is what I call ‘the knock-off’ factor in which Zip lookalikes, such as the one I have, were produced well beyond the demise of the Howdy Doody show. Columbia appears on the tag of some of these dolls identifying them as made by another toy manufacturer. My version of the rubber-faced monkey doll is apparently known as Mr. Bim, and he may or may not be holding a banana, have red suspenders or black pompom buttons, and have yellow or white fur representing a shirt. In 1984, Dakin produced an updated version of the Zip doll. In addition to the stuffed monkey dolls I’ve described above, there are a whole host of monkeys in other colors of fur, with or without hats, some with different facial configurations, and more. So while my Freddie and Ava Maria’s Mr. Monkey might not be original Zip dolls, they are no less loved. No wimpy hors d’oeuvres are the order of the day where Joe Tedesco is concerned. 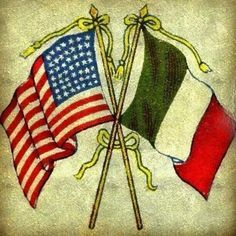 He’s an Italian/American version of a meat-and-potatoes man if you traded pasta and sauce for meat and potatoes. When Joe receives an invitation to the new neighbors’ all-guy bash, he assumes he’ll be served something subpar. To make sure this doesn’t happen, and to guarantee he has something he likes to eat, Joe brings a tray of Shirley’s famous deviled eggs. The following recipe for deviled eggs is the one I had in mind when writing the above-mentioned scene. 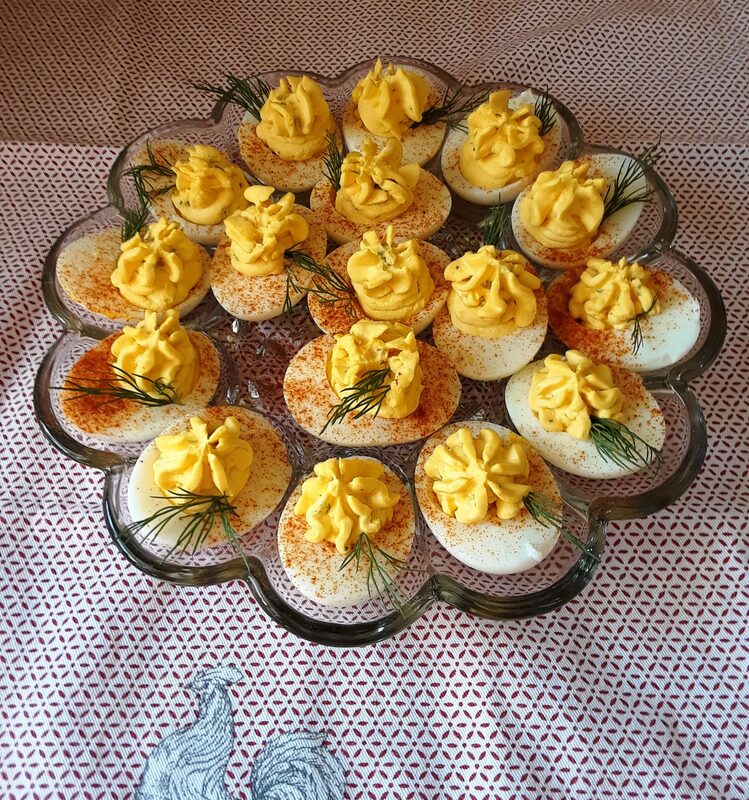 While there are a lot of great recipes out there for deviled eggs, and some of them are quite flamboyant with unexpected ingredients, I find this recipe satisfies on both the taste scale and elegance factor. Most recipes for deviled eggs will tell you not to use fresh eggs (only a day or two since laying) because despite an ice water bath, the shells will stick to the cooked eggs. You’ll end up with ragged deviled eggs. While this is true, please don’t use store-bought eggs if you can help it. They are low in nutrition and have been sitting around for far too long even for ease of use in deviled eggs. I suggest eggs from a local farmer that you allow to sit in your refrigerator for a couple of weeks. Trust me, this won’t hurt them. Place the eggs in a single layer in a large pot. Fill the pot with enough cold water to be at least one inch over the eggs. Bring the water to a boil and reduce the heat to a soft rolling simmer. You don’t want the eggs banging around in the pot. Time the eggs for ten minutes. When they are done, drain the water from the pot and refill it with cold water until you are able to handle the eggs. Peel the eggs and gently blot excess moisture and bits of shell with a paper towel. Set them on a plate until all are peeled. Chilling the eggs will firm them up even more and make them easier to handle, but you can proceed with deviling if necessary. Slice the eggs in half and carefully remove each half of yolk from the white. Set the whites on an egg tray or the dish on which you wish to serve them. Place the yolks, mayo, butter, two mustards, diced pickles, pickle juice, salt, pepper, Tabasco, and dill in a glass mixing bowl. Mash the yolks with a fork, stirring them into the other ingredients until smooth, and then continue with a whisk. The mixture will have a chunky texture from the diced pickles. If you desire a smoother filling, you may transfer the mixture to a food processor and blend until completely smooth. Sprinkle the whites of the egg with paprika. Pipe the egg filling in a spiral into the empty whites. Garnish each egg with a piece of fresh dill tucked into the egg where the filling meets the white. Chill in the refrigerator at least 30 minutes before serving. ***When choosing sweetened pickled vegetables, there are many choices on the market. Unfortunately, most have high fructose corn syrup in them. Try a farmer’s market that sells products with recipes closer to home-canned goods. I’ve had great success in such stores. One of the weirdest things I had to research for my novel, The Tedescos, was the song “Witch Doctor.” I checked first of all to make sure it had been released before my story took place. The song, performed by Ross Bagdasarian Sr., was released in 1958 by Liberty Records. Bagdasarian is better known by his stage name David Seville. 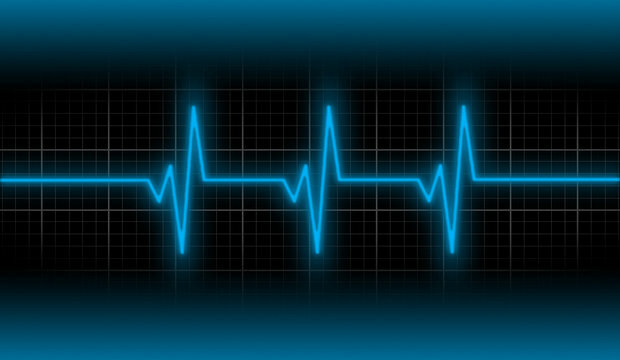 The song peaked at number one on the Billboard Top 100 and was considered a surprise hit on the chart. 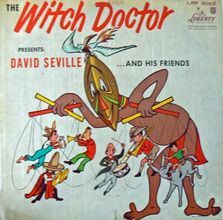 “Witch Doctor” became David Seville’s first number-one single and held this position for three weeks. The single sold over one million copies in the United States and finished at the number-four spot on Billboard for 1958. And let me tell you, there is heated debate to this minor detail. Some people will sing every line of the witch doctor’s comments as “bing bang” while other sticklers for detail will insist upon singing it the correct way as “bing bang” the first time followed by “bang bang.” I actually watched the video of David Seville singing the song, my eyes narrowed in concentration to read his lips, just so I could settle the dispute. The witch doctor’s voice is Bagdasarian’s own voice sped up to double speed. This technique was later used when Bagdasarian, as David Seville, created Alvin and the Chipmunks. Grandma Josephine Tedesco borrows the witch doctor’s famous line when her youngest son, Danny, involves her in a crazy, money-making scheme. Because Grandma Josephine isn’t always aware of what she’s doing, she’s given a pass. However, Danny does not fare so well when his older brother, Joe, finds out he employed their mother in shady business. Since I don’t want to be the only one with this annoying lyric stuck in my head, I have provided a link to Ross Bagdasarian/David Seville singing “Witch Doctor” on The Ed Sullivan Show. Joe Tedesco likes his neighbors… as long as they keep the grass mowed and don’t throw loud parties. These standards, to which Joe himself conforms, are most definitely kept by the new neighbors, and yet they still cannot win over Joe to liking them. In a last ditch effort to secure the head of the Tedesco Clan’s friendship, they invite Joe and all the men from the neighborhood over for a party. The new neighbors are clever and know the way to Joe’s heart is through is stomach. The menu they plan is spectacular and includes the following recipe for classic Reuben sandwiches. These babies are mammoth and worth every savory, saucy bite, so don’t skimp on the corned beef. Whisk all ingredients together in a bowl, cover, and chill in the refrigerator. The dressing lasts for three days stored in this fashion. I recommend making the dressing at least one day in advance to give the flavors time to meld. Empty the jar of sauerkraut into a colander and press out any remaining juice. Place the drained sauerkraut in a saucepan with the apple, brown sugar, apple juice, and salt and pepper to taste. Bring to a boil and reduce heat to low. Simmer until the apple is tender. Turn off the heat, cover, and leave on the stove until needed for sandwich assembly. Preheat the oven to 350° F. I opt for thick slices of corned beef because I find it keeps the sandwiches from sliding around on the bread. Create a foil packet and place the corned beef inside. Place the packet on a cookie sheet with edges. Add 3 T of water to the packet and seal the meat inside. Put the baking sheet with the foil packet on it in the oven and bake for 8 – 10 minutes. While the meat bakes, spread one side of each slice of bread with softened butter and toast the buttered side in a cast iron skillet. Transfer the toasted pieces to a baking sheet with the buttered side down. Spread the Russian dressing on the untoasted sides facing up. On six of the bread slices, layer pieces of corned beef, making sure to drain any moisture, until the meat is evenly divided. You may need to fold your corned beef slices in half to make them fit. Place a hefty portion of well-drained sauerkraut on top of the corned beef. Top off with a slice of Swiss cheese. On the remaining six slices of bread, place another piece of Swiss cheese. Pop the sandwiches into the oven and toast for three minutes or until the Swiss cheese melts. 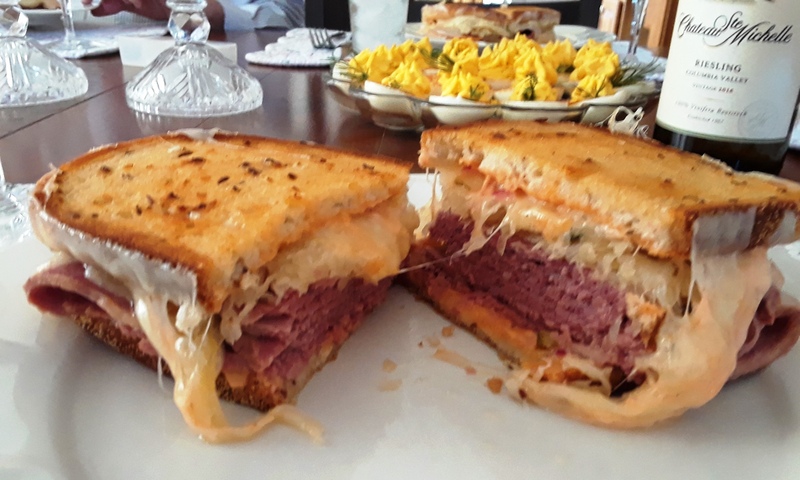 Remove from the oven and match up the corned beef, Swiss, and sauerkraut side with its Swiss cheese only mate. Give a gentle press to hold it all together. You may wish to cut it in half. Serve immediately. 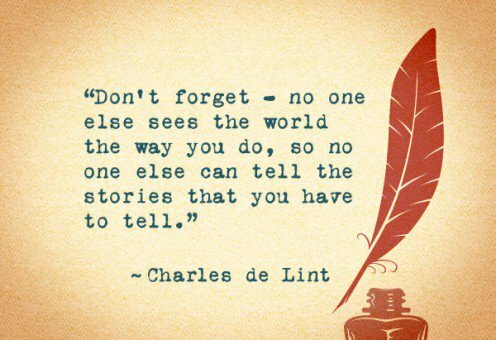 As I prepare to query my novel, The Tedescos, I thought I’d better introduce the family to you so you’ll know who I’m talking about in upcoming blog posts for Research Road and Edible Fiction. Joe Tedesco is the big-hearted, sometimes clueless, but always lovable patriarch of the Tedesco Clan whose primary job is to bring home the bacon and do his best to not muck things up too badly for his lovely wife, Shirley. Shirley Tedesco is the savvy, stay-at-home matriarch of the Tedesco Clan responsible for keeping her husband, their brood of eight rowdy children, and her crazy mother-in-law in line. Hers is a difficult task. Sixteen year-old Joe Jr. is the good-natured, oldest sibling with a love for sports, girls, and food, but not necessarily in that order. Katherine, the second oldest sibling at fourteen, is a mastermind of manipulation who knows how to play her father for whatever catches her eye. Thirteen year-old Ava Maria is the saintly, third oldest sibling whose limitless compassion extends to stuffed animals, overworked nuns, and anyone in need of prayer. Holly and Noelle, ten years-old, are the pink and blue wearing Christmas twins possessing twice the sweetness or twice the mischievousness depending on what the situation requires. Billy (age seven), Grace (age six), and Pauline (age five) are the youngest three siblings who work as a unit whether it’s planning or executing the next round of trouble they’re going to get into. Grandma Josephine, Joe’s widowed mother, lives in the twilight realm between long-term memory and reality as she navigates her way through the golden years. Danny Tedesco, Joe’s younger brother, is the unmarried, shiftless member of the family who is long on money-making schemes and short on work ethic.